In this image made from video and posted online from Validated UGC, a man carries a child after airstrikes hit Aleppo, Syria, April 28, 2016. U.S. Secretary of State John Kerry says he is "outraged" by an airstrike on a Syrian children's hospital in Aleppo, directly blaming President Bashar al-Assad's forces. 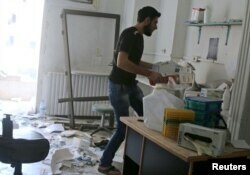 The airstrike destroyed the hospital, which was supported by Doctors Without Borders. At least 20 children and doctors were killed, including the last pediatrician working in rebel-controlled areas of Aleppo. "It appears to have been a deliberate strike on a known medical facility and follows the Assad regime's appalling record of striking such facilities and first responders,” Kerry said Thursday. "These strikes have killed hundreds of innocent Syrians." The airstrike was part of a bloody 24 hours in Aleppo which saw more than 60 people killed in fighting between Syrian forces and rebels. ​United Nations envoy Staffan de Mistura says the February cessation of hostilities that he helped negotiate "hangs by a thread" and could totally collapse at any time. Kerry is calling on Russia — Assad's top ally — to use its influence to get him to stop the attacks. A man removes medicine inside al-Quds hospital after it was hit by airstrikes, in a rebel-held area of Syria's Aleppo, April 28, 2016. "Russia has an urgent responsibility to press the regime to fulfill its commitments under UNSCR 2254 [United Nations Security Council Resolution], including in particular to stop attacking civilians, medical facilities and first responders, and to abide fully by the cessation of hostilities," Kerry said. But de Mistura is urging both the United States and Russia to revive the peace talks. "In the last 48 hours, we have had an average of one Syrian killed every 25 minutes, one Syrian wounded every 13 minutes," he said Thursday. U.N. aid chief Stephen O'Brien addressed the Security Council on Thursday, saying that all members "must be ashamed" by what is happening in Aleppo. Aleppo is Syria's largest city. Both the Syrian government and rebels control different parts of the city while numerous groups, including al-Qaida and Islamic State, control parts of the surrounding province. Syria and the opposition agreed on a temporary truce in February, aimed at setting the stage for peace talks. The Islamist militants were not part of the truce and the government assault against them continues. But the Syrian airstrikes do not appear to discriminate between the extremists and the so-called moderate opposition. The pro-government newspaper Al-Watan reports that the Syrian army is now set for a "decisive battle" against rebel strongholds in Aleppo. It says the final battle for Aleppo "will not take long to begin, nor to finish."